Legendary artworks and precious photography of Li Yuan-chai(1929 – 1994), the pioneer of abstract and conceptual art of Taiwan, will be exhibited at Each Modern’s first show of 2019 along with the young artists Chang TingTong, Chou ShihHsiung, Lan ChungHsuan, Lin YiHsuan, Wu ChuanLun, Xu Jiong to create a conversational exhibition that cross the time and the space. Each Modern is pleased to present “Re/Born” at Taipei Dangdai, in celebration of the new art fair and name change of the gallery. The exhibition places a group of works made over the new practice of legendary artists, in dialogue with a series of extraordinary experiments of new art forms by emerging artists. The artists include Chou ShihHsiung, Lin YiHsuan, Moriyama Daido, Hiraku Suzuki, Teng NanKuang, Xu Jiong, Yin ZhaoYang, Zhao Gang, Eric Zetterquist. At the “Salon” section, young Taiwanese photographer Wu MeiChi’s iconic work will be exhibited. We welcome your visit. 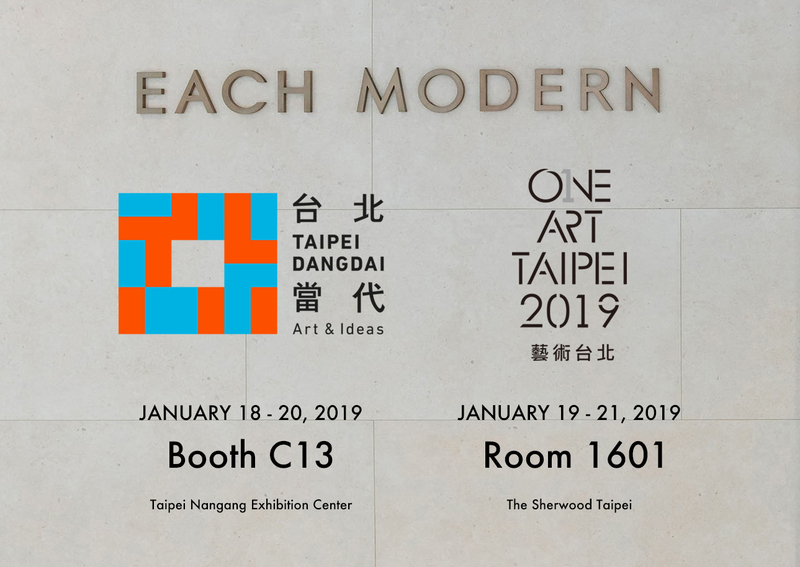 At the new hotel art fair ONE ART Taipei, Each Modern will present four young Taiwanese artists including Juan Sea, Lan ChungHsuan, Ling Yung, Wu Meichi at the “Media Art” section to explore the new generation through their photography and image-base art.